John Wm. Macy Cheddar & Asiago Cheese Crisps -- Sourdough is the secret behind these award-winning, savory, all natural twice-baked cheddar and Asiago cheese crisps. With the perfect crunch and heavenly taste, John Wm. Macy cheddar and Asiago cheese crisps have garnered rave reviews since their introduction 25 years ago! 100% real aged cheddar and Asiago layered with fresh sourdough, the cheese crisps are baked twice for the perfect crunch! Cheddar and Asiago cheese crisps are ideal as croutons for soups or salads. Reheat for 5 to 10 minutes at 250 degrees and serve warm from the oven. Add your favorite toppings for a simple, tasty appetizer. John Wm. Macy's flavor-packed cheddar and Asiago cheese crisps set the standard by which all others are judged! Ready to serve, savor the ultimate snack, Enjoy! John Wm. 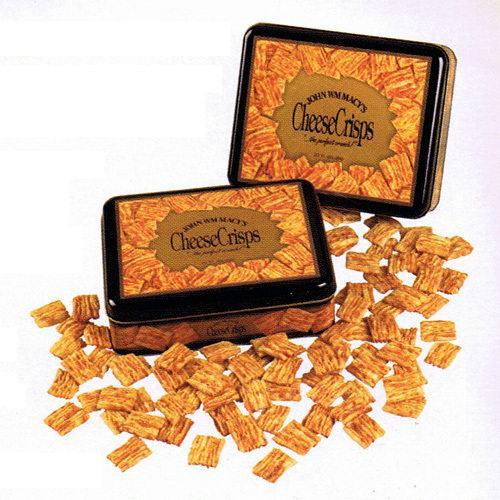 Macy Cheddar & Asiago Cheese Crisps Gift Tin.